A young family is captured in this portrait by Soderberg studio in Sutton, Nebraska. The family is well dressed. The mother is an attractive woman and her daughter is adorable. 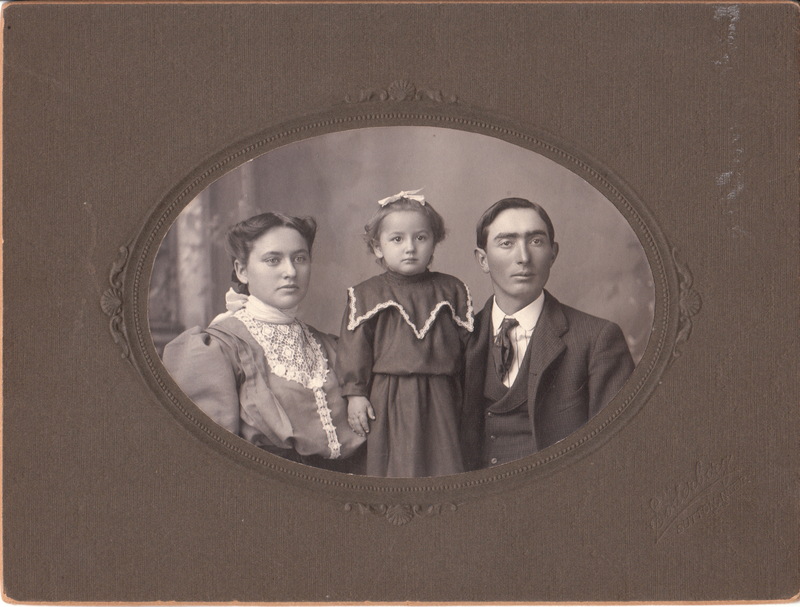 The little girl stands in front of her parents, clearly front and center in the photograph. One could hazard a guess that she was also front and center in her parents lives. Pont Sonderberg is listed by the Sutton Historical Society as one of the town’s early photographers. Langdon Road, a historical directory of photographers, asserts that Soderberg operated a studio in Sutton between 1890 and 1905. In addition, the directory states that he had previously been in business during the 1880’s as Smith & Soderberg in Marengo, Iowa. 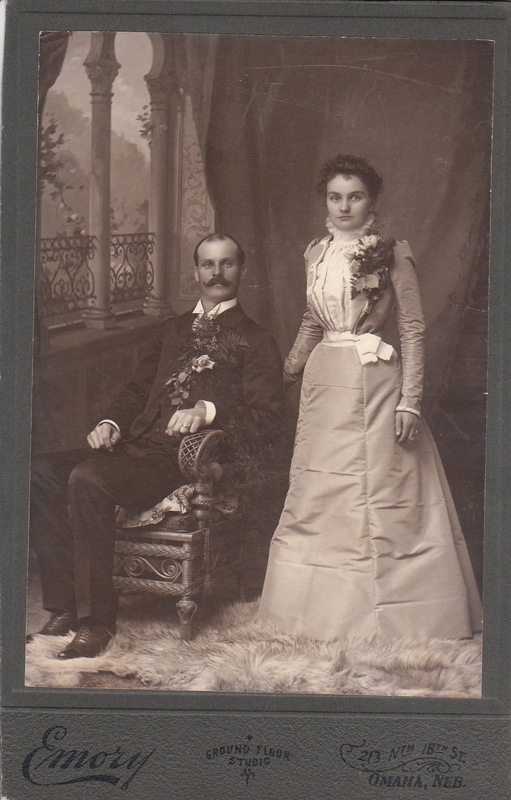 This photograph is a portrait of a young wedding couple taken by the Olson studio in Newman Grove, Nebraska. 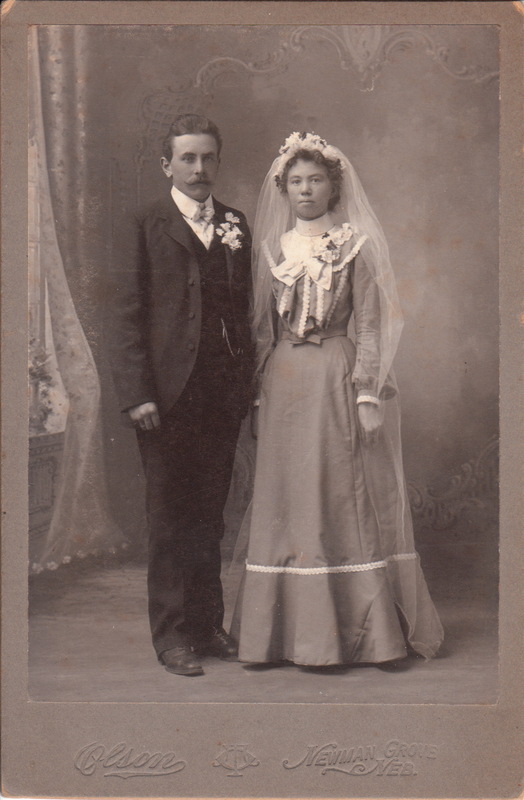 The wedding couple is well dressed and the bride is wearing a non white wedding dress adorned with flowers.Thorsten Olson established Newman Grove’s Olson studio in 1888. Research indicates that the studio operated until the 1950’s. Newman Grove is an agricultural community that was settled in the late 1860’s and incorporated in 1888. In 1886 the Fremont, Elkhorn, and Missouri Valley Railroad established a route through Newman Grove. 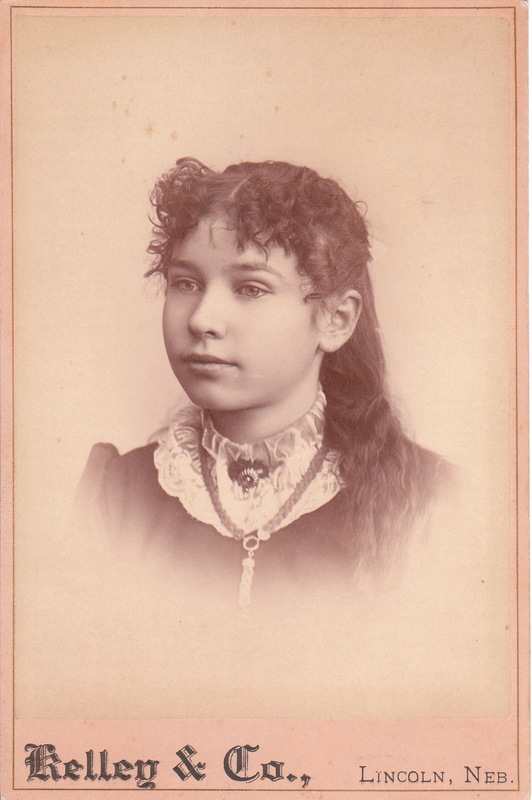 An adolescent girl poses for her photograph at Kelley & Company of Lincoln, Nebraska. 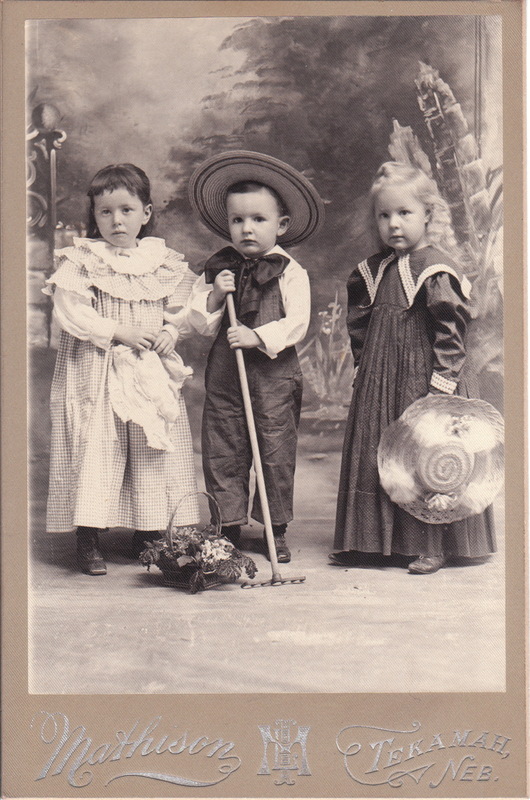 The curly haired girl is wearing a lace collared dress and a collar brooch and rope chain necklace. H. W. Kelley’s photography studio is listed in the Lincoln business directory of 1887. A pensive and pretty young girl with very long hair poses for her portrait at the LeGrande studio in Lincoln, Nebraska. She is wearing a necklace, a collar pin, and a dark dress. Resarch found information concerning the LeGrande Studio to be sparse. At one point in time, the studio was located at 1245 Twelfth Street in Lincoln and its proprietors were named Speake and Peirson. Jefferson Grant Speake (1863-?) was listed in the 1891 and 1893 Lincoln Business Directory. He was listed as a photographer and owned the LeGrande studio. He is noted in the 1900 US census, and both he and his wife of 13 years, Hattie E. Speake (1863-?) appear in the census as living in Omaha, Nebraska and both Jefferson and Hattie were reported to be photographers. The 1902 Omaha business directory also lists Jefferson Speake as a photographer. No information could be found about Mr. Peirson, Speake’s Lincoln business partner. This photograph features a woman in a bustle style dress posing for a full length portrait at the Gray studio in Omaha, Nebraska. 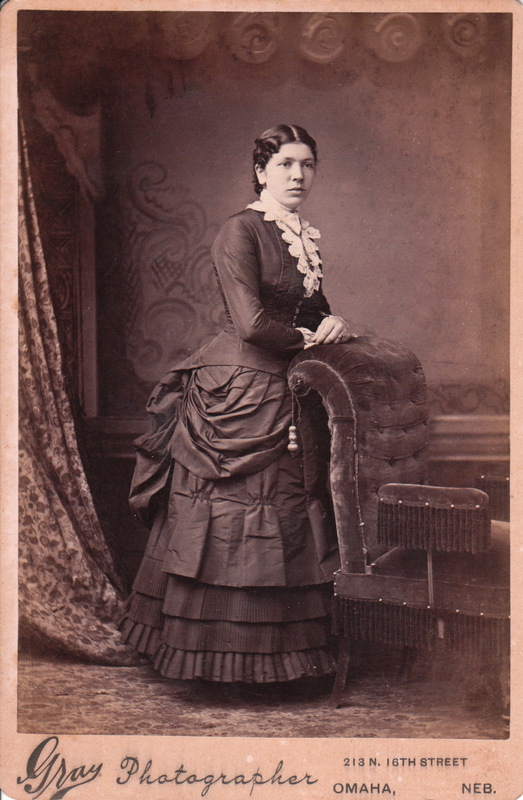 The dress seems to play a more prominent role than the subject in this cabinet card image. In 1884 Howard E. Gray took over the Bee Hive Gallery at the address listed on this cabinet card. In about 1886 he changed the name of the studio to the H. E. Gray Studio. Omaha business directories indicate that he was operating a photography studio in Omaha from 1884 through 1896. The 1896 directory announces that Gray had moved to Houston, Texas. Research was able to pick up Gray’s trail in Houston. Business directories state that he was a photo retoucher in in 1897 and from 1899 through 1911 operated a photography studio. Research yielded no definitive information about his family. He may be listed in the 1900 US census but there is no confirmation that Howard E. Gray listed is the same Howard E. Gray who worked as a photographer. The 1900 census Mr. Gray was 36 years-old and married to Maggie Gray (age 38). 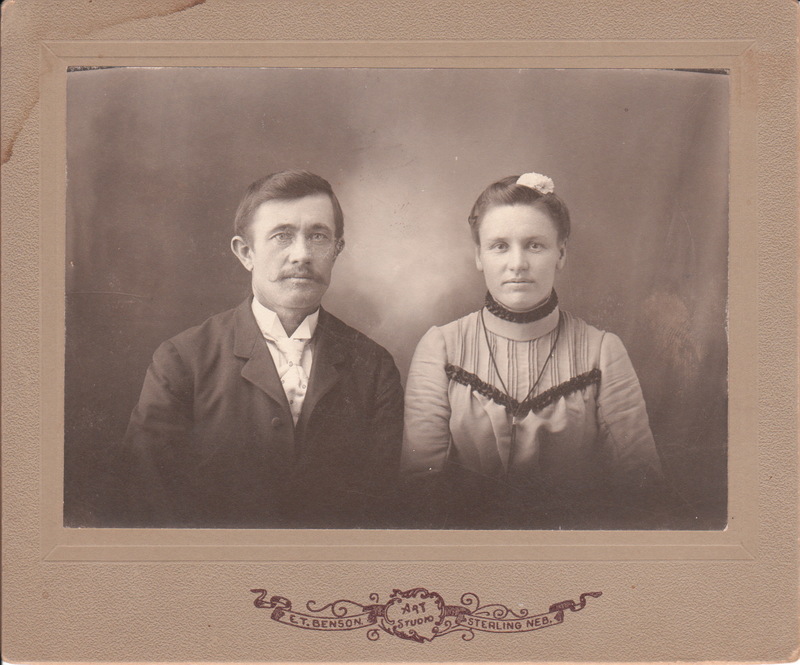 The couple was married in 1885 and had a son named Elmont (age 12). Interestingly, the census Mr Gray was listed as working as a stenographer. To view other photographs by Gray, click on the category “Photographer: Gray (NE)”. The Trimble studio of Nebraska City, Nebraska, produced this photograph of an elderly man with a bristly beard and a bushy mustache. Take a look at this man’s eyes. They seem like tired eyes. The 1900 US census identifies Henry (age 29) and Robert (age 54) as being photographers in Nebraska City. Henry was married to a woman named Maggie and Robert’s wife was named Martha. 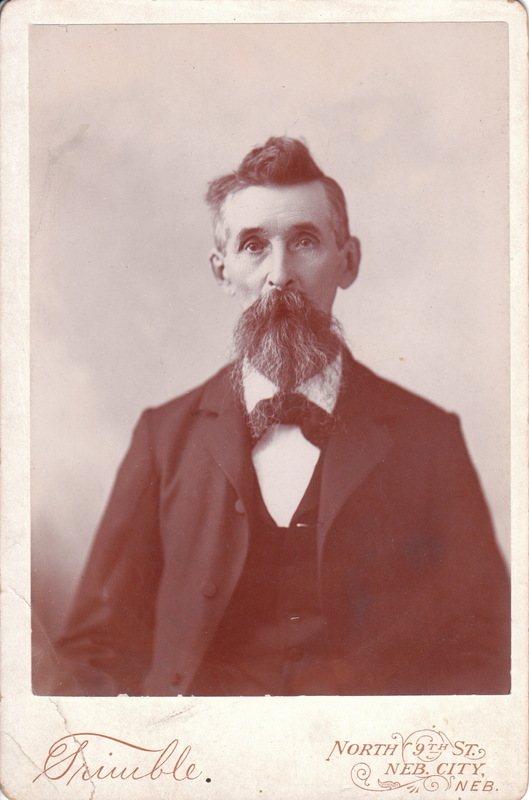 To view other cabinet card images of interesting beards, click on the category “Beards (Only the Best). 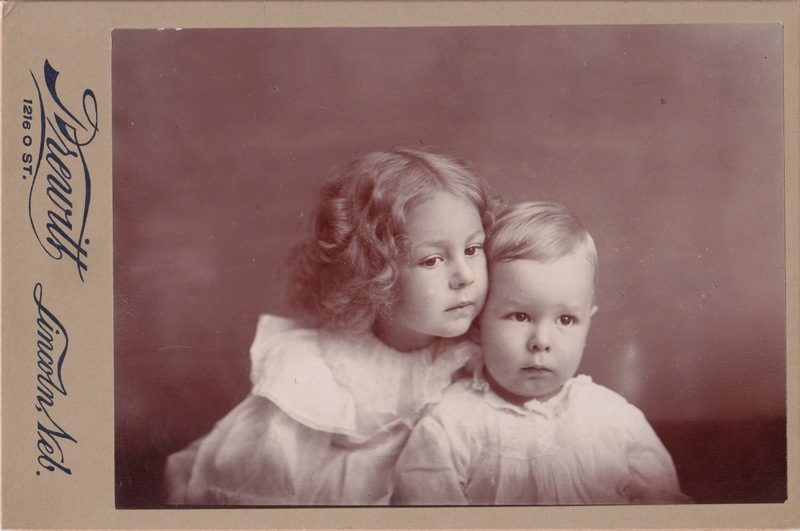 This cabinet card captures a little girl’s love for her younger sibling. The younger child appears to have no time for love during the photographic process. In fact, the child looks a bit afraid and troubled by the activities occurring in the photography studio. The photographer of this image has the last name of Drewitt and his studio was located in Lincoln, Nebraska. Research yielded no information about the photographer. This wedding photograph features a beautifully dressed and handsome bride and groom at the Emory studio in Omaha, Nebraska. The couple are wearing large rose corsages as well as wedding bands. The photographer utilized a wonderful backdrop in posing the newly married couple. A photographer historical directory indicates that Horace S. Emory (1864-1922) operated as a photographer in the 1880’s and 1890’s. He also appears in the US Census in both 1900 and 1920. His occupation is listed as photographer in both censuses. His wife’s name was Mary Emory. The Bulletin of Photography (1922) reported that Emory was working for the Dean Studio in Omaha when he “dropped dead on January 11th. He had just completed taking a photograph”. He was 58 years old.